The name itself suggests its purpose. The beautiful picture created by rain and then rainbow appeals to everyone’s senses. So is the brand Rain &Rainbow, which has become an icon of attraction for the females. Initially, Rain &Rainbow was launched in India in March 2012 with its 18 stores only. In quiet a short time, the brand has established itself in various cities of the country. Rain &Rainbow is a ready to wear garments shop for women. It deals with Kurtis, western wear and tops. Rain &Rainbow provides you with a wide range of apparels having fresh vibrant looks that too at an affordable price. Rain &Rainbow excels in the unification of prints and colours that could bring vibrancy within you. Rain &Rainbow is a distinguished class for its cut, detailing and finishing. 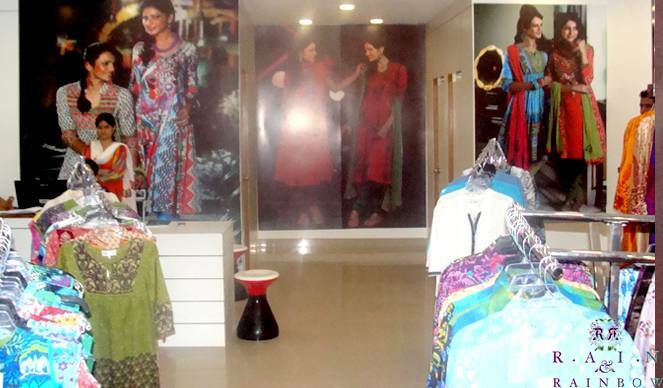 Rain &Rainbow installed at Celebration Mall in Udaipur provides women with both contemporary and western wear with intricate detailing and embroidery. For women desiring style and colour together, Rain &Rainbow is a must visit destination. We hope to start chains of Rain &Rainbow in other parts of city as well. Do visit and enjoy the beauty of rain and colours of rainbow at Rain &Rainbow.